Did you watch The Wind Rises, the last animated film by Hayao Miyazaki? Definitely a must watch if you are a fan of his animation. There were tears in my eyes throughout the show. I remembered the last time I felt such sadness was when I was watching another animation "Grave of the Fireflies" by Studio Ghibli (not written by Hayao Miyazaki). 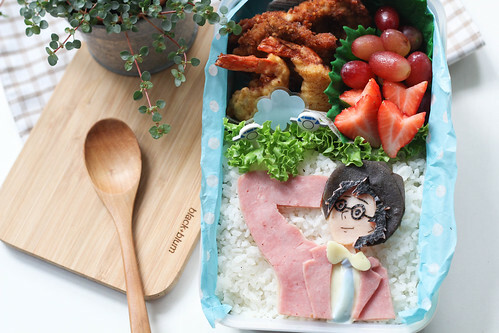 I made Jiro, the main character in the animation in this bento. He is made out of nori, ham, cheese, Kombu and egg white (dyed blue by soaking in butterfly pea flower water). 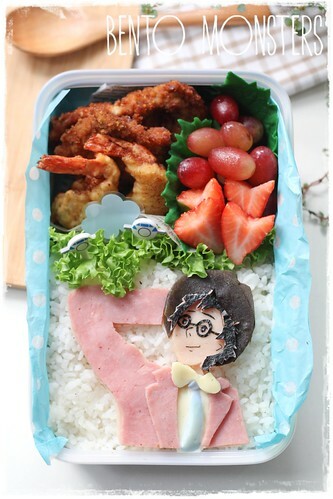 Side dishes for this bento were pork cutlets, fried prawns, lettuce and strawberries. Ever since my boys are willing to eat lettuce (since last year), I've been giving them lettuce for lunch on most days, save me the trouble of cooking veggies in the afternoon. I'll end this post with a quote from this film which left a deep impression on me, it pretty much sums up the whole message the film is conveying as well. "The wind is rising, we must live!" Wonderful! 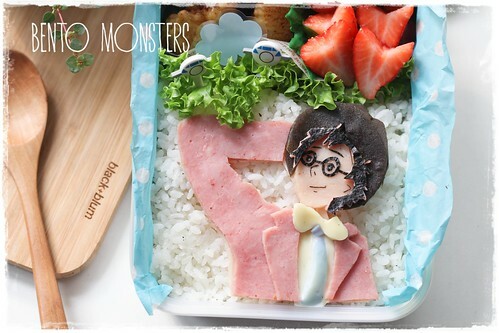 I love how well the ham relates to his suit! I was also very moved by the Wind Rises, can't wait to see it again. http://thatumamilife.wordpress.com - a clean eating bento blog. Japanese or Asian-inspired! Love the details! Nicely done! Cant wait to watch this film!